IT WASN'T a "debate." And it certainly wasn't presidential. The spectacle in St. Louis Sunday night was, as usual, an electoral cage match. Its purpose was not to clarify differences in policy, but to maximize the candidates' discomfort and provoke them into as many gaffes, insults, and incoherent-but-quotable sound bites as possible. For 90 minutes, tens of millions of Americans watched two would-be presidents heap a little more degradation on American democracy. What an embarrassment. If you had the good fortune not to be watching last night, here's some of what you missed. Donald Trump told Hillary Clinton that if he wins the election, he will "instruct the attorney general to get a special prosecutor" to investigate the scandal of her deleted e-mails, "because there's never been so many lies, so much deception." Clinton said it was "awfully good" that a man with Trump's temperament wasn't in charge of law enforcement. Trump shot back: "Because you'd be in jail." Such threats used to be a specialty of banana republics. Now you can hear them from an American presidential contender. Asked about his graphic sexual remarks on a live mic in 2005, Trump allowed as how he was "not proud" of what he'd said. 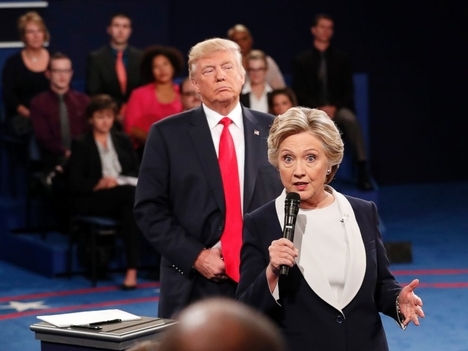 Then he abruptly switched to the subject of Bill Clinton and how "there's never been anybody in the history of politics in this nation that's been so abusive to women." With the former president sitting in the audience, Trump bored in: "What President Clinton did, he was impeached, lost his license to practice law, had to pay an $850,000 fine to one of the women." That woman was Paula Jones, who was also sitting in the audience. She attended the debate as a guest of the Trump campaign — along with two other women who have accused Bill Clinton of sexually assault. Hillary Clinton was challenged to explain the leaked speech in which she told a closed audience of Wall Street financiers that on controversial issues she has "both a public and a private position." Is it really OK, a questioner asked, for politicians to be so two-faced? Her answer: "That was something I said about Abraham Lincoln, after having seen the wonderful Steven Spielberg movie." Her opponent's rejoinder: "So ridiculous. Now she's blaming her lie on the late, great Abraham Lincoln." Who won the "debate"? The question is pointless. Trump's supporters were not won over by Clinton, and her supporters didn't cross over to him. The clear loser, on the other hand, was the American electorate. Nothing about the encounter was uplifting or encouraging. The closest the candidates came to an agreeable exchange was in answering the very last question: "Would either of you name one positive thing that you respect in one another?" Clinton praised Trump's "incredibly able and devoted" children. Trump saluted Clinton for being a fighter "who doesn't quit." That brief moment of civility lasted, perhaps, three minutes. It didn't begin to neutralize the 87 minutes of bickering, put-downs, and contempt that preceded them. And it will it do nothing to minimize the grim prognosis facing the world's great superpower: In just four weeks, barring a miracle, one of these two deplorable and dishonest people is likely to be the president-elect of the United States. God have mercy.